Audit Conditions are applicable to various activities inside and outside of the SentryOne client. 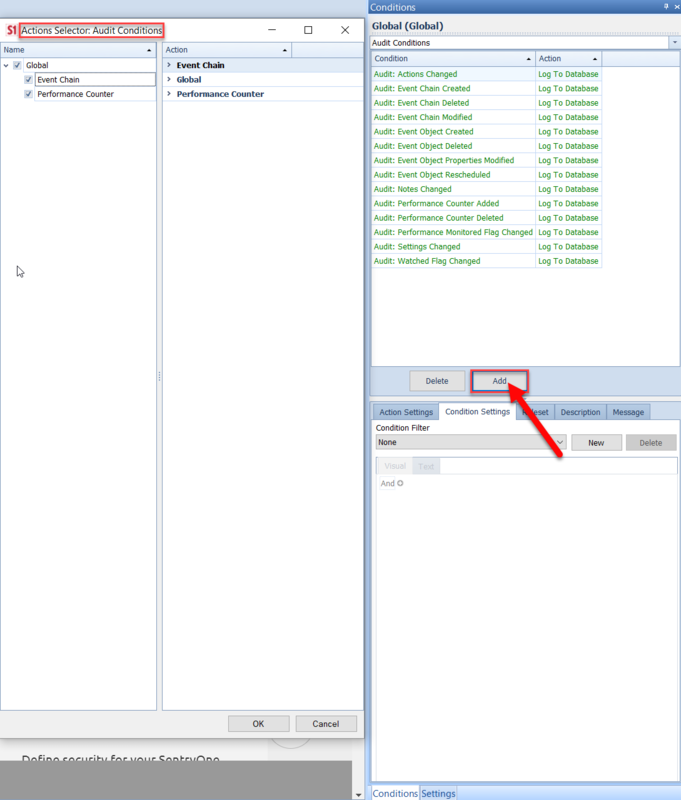 Audit Conditions provide a way to be notified when various settings are changed, or monitored objects are modified from within the SentryOne client. Note: The Log to Database action is configured by default for all Audit Conditions. This gives you an audit trail concerning changes to your SentryOne environment. If you'd like to be notified about Audit Conditions happening in your environment, configure the Send Email Action. Configure additional actions in response to Audit Conditions being met at these levels: shared groups (Global), site, computer group, computer, and connection. Select the node appropriate to the level you'd like to configure the action for in the Navigator pane, and then the Audit Actions tab in the Conditions pane. If you don't see the Conditions pane select View > Conditions. Select Add found in the Conditions pane to open the Actions Selector window. Expand the applicable object and condition. Use the checkbox(es) to select which actions should be taken in response to this condition being met, and then select OK.
For a complete listing of all Audit Conditions, see the following tables. Audit: Event Chain Created An Event Chain is created. Audit: Event Chain Deleted An Event Chain is deleted. Audit: Event Chain Modified An Event Chain is modified. Audit: Actions Changed A configured action is changed for an object. Audit: Event Object Created An Event Object (job, task, etc.) is created. Audit: Event Object Deleted An Event Object (job, task, etc.) is deleted. Audit: Event Object Properties Modified An Event Object's (job, task, etc.) properties are modified. Audit: Event Object Rescheduled An Event Object (job, task, etc.) is rescheduled. For some object types, this condition is only detected when rescheduling in the SentryOne client by dragging-and-dropping. Audit: Notes Changed A note is changed. Audit: Settings Changed Object or application settings are changed. Audit: Watched Flag Changed The watched flag is changed for an object. Audit: Performance Counter Added A Performance Counter is added to an event object or event view. Audit: Performance Counter Deleted A Performance Counter is deleted from an event object or event view. Audit: Performance Monitored Flag Changed The Performance Monitored flag is changed for an event object or event view.